Julia's been going on and on about Christmas, but it's time for me to say a few words about it. Julia was all about what was inside the presents, but I was perfectly happy to enjoy them in their wrapped state. I had a great time jumping and munching on my gifts. Once I opened them, I was in for an even bigger treat. Because Santa brought me a ball popper, which pops balls into the air. I don't think I've ever had so much fun! I got so many great Christmas gifts from everyone, like this princess throw (complete with a tiara!) from Aunt Jess. But as for Santa, well, he managed to be both naughty and nice when it came to leaving gifts for me under the tree. By the way, you've probably been hearing lots of coughing and sniffling in the background of all these Christmas videos. That's because Mom, Dad, Henry and I were all sick over Christmas, but I'll let Henry talk more about that in the next post. He came, he came! It was so exciting. Henry and I opened our stockings first, and our favorite stocking stuffers were the rubber duckies that Santa got both of us. Well, Henry and I certainly had a very merry Christmas (though not, alas, a very healthy one, but more on that later...)! There are a LOT of videos and photos to share, so let's get right to it. This post will be all about Christmas Eve. In the morning, Mom and I continued our tradition of putting together the gingerbread house. Then Grandma, Grandpa, Aunt Jess and Uncle Ryan came to spend Christmas with us. We were so happy to see them! Mom got me the prettiest dress to wear, but I didn't want Dad to take a picture of me in it. But I finally relented...isn't it gorgeous? After going to Christmas mass and enjoying our traditional Ukrainian Christmas Eve dinner (with goodies like borscht, vushka and pyrohy), Mom and I baked cookies for Santa and left him cookies and milk. Then I went to bed to await Santa's arrival. Merry Christmas! Sorry we've been MIA this week but A) we're sick (yes, again!) and B) we've been busy getting ready for Christmas! We're so excited that Christmas Eve is finally here. Grandma, Grandpa, Uncle Ryan and Aunt Jess are all coming today...and so is Santa! All I want for Christmas is my two front teeth (but any tooth will do, just so I can stop with all this drooling), but Julia has a much longer list for Santa, including a jack in the box, a backpack and a hoppity ball. I think we've both been good this year, so hopefully Santa will bring us what we want. Though as you can see below, as long as I have some wrapping paper to play with tomorrow, I'll be perfectly happy. Happy holidays to all of you, and may all your Christmases be white! Just before the snow arrived this weekend, we had some friends over for a holiday party. It was great fun, because I got to see lots of my friends, have some of Dad's delicious cookies and best of all, open my presents! Everyone was having so much fun that we barely remembered to take photos and videos. But here's one of me and Nia. And here's one of Henry and Anne! And here's a quick video, with just a few moments from early on, before the party really got into full swing. Mommy wants to know why you tolerate wearing pink bibs. When you drool as much as I do, and soak through three to four bibs a day, you have to learn not to be picky about what color bibs you're wearing. Because the alternative is to go bib-less and be stuck with a wet shirt all day, and I sure don't want that! You sit up so good. Have you made any attempts to crawl? I'm getting close. Mom and Dad think that I'll be mobile in another month or so. I do a bit of shimmying around right now on my tummy, so it's only a matter of time before I figure it out. Do you think that once you do that Julia's toys will be at risk? Heck, yes! And I think that's when the honeymoon officially ends between us, because my big sister does not like to share her stuff! I asked a question a few months ago about never seeing you in shoes. I see that you are now wearing them. Have you tried to take them off yet? Take them off? No. But I sure to love putting them in my mouth when I'm wearing them. It's fun being so flexible! 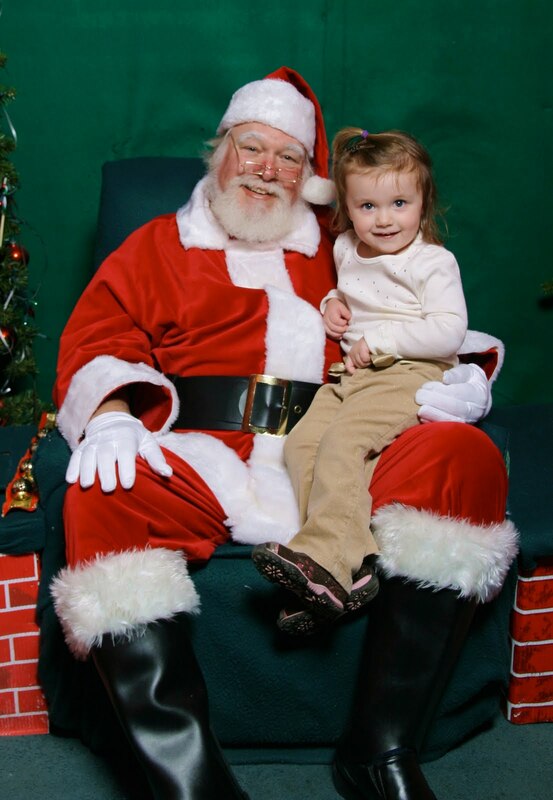 Do you think that you might be going to see Santa? I don't think so. I wasn't around when Julia went a few weeks ago, and I don't think our paths will cross until he visits on Christmas Eve. What is the next new food that you will be trying out? I try something new every few days, now that I've moved up to Stage 2 foods. On the menu this week: butternut squash, raspberries and mango. I love your new coat, hat, and scarf. You look adorable. Did you pick it out yourself? Thanks, but all the credit goes to my personal stylist, Mom, who always makes sure that I'm impeccably dressed and that whenever I grow into a bigger size, there are always an array of suitable (and super-cute) outfits waiting for me. Do you have a list ready for Santa the next time you see him? I don't have a list yet, but I always make sure go through all the catalogs that arrive in the mail, point to items on each page and announce that "Santa will buy me this, and this, and this..." Does that count? What are you learning in school? So many things. Every day I sing new songs, and I've been saying "thank you" to Mom and Dad alot, which I also picked up there. On Tuesday, Mom and Dad have a parent-teacher conference with my teacher, and I'm sure she'll tell them how I'm one of the best students ever! Do you get off for the holidays? Yes, I'll be off for a little over a week. Are going to go see the tree in NYC? I don't think so, I'm sad to say. It doesn't help that Henry and I are both congested again (we can't stay healthy for more than a week, it seems! ), which makes it even less likely that Mom and Dad will cart us around outside in the cold. Do think you are going to get your own makeup bag for Christmas? No, because I already have one: Mom's! And that wraps up another mailbag. As always, we'd love to hear your questions, so send them to us, and hopefully we can do another Ask Julia & Henry column shortly after the new year without having to beg you guys for questions. Henry really seemed to like it too. His eyes were bugging out! Every day, I get more and more excited about Christmas coming. I'm so happy that it's almost here! Every month or so, I unearth an older photo that slipped through the cracks and was never published. Dad shot this photo on his cell phone a while back when the two of us were out to lunch at Red Robin. It was our first time sitting together face-to-face in a booth. Doesn't it seem like I'm all grown up? And speaking of things I forgot to post, I just realized I never passed along my updated stats from my checkup a couple weeks back. I now weigh 35 lbs and measure 37.75 inches. Wow, I guess I am all grown up! Now that I've been sitting up for a bit, Mom and Dad decided that I was ready to bathe in the tub. They got me a new seat that keeps me secure in there. I really like it, and so do Mom and Dad, because they don't have to worry about holding me upright the whole time! But the big treat came after I took a few baths in the seat by myself. They let Julia join me! I started kicking and splashing, I was so excited to be in there with her! Rub-a-dub-dub, it's Julia and Henry in the tub! I'm taking long naps now! No more 30-minute limits on my daytime snoozes. I'm regularly going down for an hour or more—sometimes well in excess of two hours! Finally, after more than a month of not making much progress on eating, I've started polishing off my meals. Now, almost all of it goes in my tummy, instead of being spit out onto my bib. See what happens when people finally give me some good stuff to eat, like fruit? That's it for the weekend. Julia and I are finally going to post a new Ask Julia & Henry column next week (now that we have some questions), so if you want to send some questions in for the last time in '09, this is your last chance. More than six months since I first came along, Julia and I still get along incredibly well. We love each other so much (well, except when I touch any of Julia's stuff - she doesn't like that one bit!). One of our favorites games to play is when Julia lies down so I can "get" her, by going on top of her. And now that I'm teething, I love munching on my big sis (and although she pretends that she doesn't like it, I know that she really does!). Take a look. and do puzzles. And on weekends, I've already started going to my classmates' birthday parties One popular birthday party location is at my favorite place, the Little Gym. They inflate the air track and I go crazy, bouncing away! And what's the only thing better than an air track at a birthday party? Cake, of course! You can see Isabella out of focus sitting next to me. I'm sure there will be more photos in the coming months, and I'll be sure to share them with you. Mother Nature had a nice treat for me Saturday: I got to see my first snowfall! Mom and Dad brought me out on the porch, where I saw big snowflakes falling from the sky. Sadly, the snowy fun was short-lived. While Julia did get to make and throw a few snowballs that night, by Sunday it was already melting, so neither of us was able to go sledding. That's okay; I'm sure we'll have plenty more chances before winter is through! When Mom was a kid, she and Bobbi had a tradition of going to see the Nutcracker Ballet together every Christmas. Well, I'm happy to announce that Mom and I (and Bobbi too!) are now continuing that tradition. 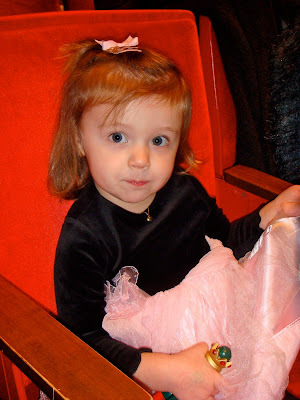 On Saturday, they took me to see my very first performance of the Nutcracker ever (come to think of it, it was my first time seeing any kind of performance!). Mom and Dad weren't sure how I would react, but I was really well-bheaved. I talked a little bit in the beginning, asking Mom where Clara was, and where the mouse was, but after that I was completely taken by everything. I thought seeing it on the DVD was great, but it was nothing compared to seeing it in person! I even brought my nutcracker along with me and held it for the whole performance. After it was over, I came home and had a snowball fight with Mom and Bobbi. A perfect end to a perfect day! One thing I love about spending Thanksgiving at Grandma and Grandpa's is that Mom and Dad kick off the Christmas season by taking me to G-Boys so I can enjoy their winter wonderland. I enjoy this trip more every year, as I get older, which means that this year's visit was the best one yet! Yes, I saw Santa Claus! As you can see, I was so stunned to see him — Mom and Dad didn't give me any warning — that I completely blanked on what I wanted to ask him for, and just agreed with everything he suggested. Oh Santa, you aren't really going to get me a princess dress, are you? I already have a bunch of those! Hey guys, many of you have noticed that our Twitter feed to the right is messed up, and showing someone else's feed. It's a bug in the widget that eventually will fix itself, but right now you'll just have to ignore it. If you want to keep up with our Twitter feeds in the interim, mine is located here and Henry's is here. Okay, now on to bigger and better things. Here's a few more things that we were up to over the weekend at Grandma and Grandpa's house. As usual, I pestered Grandma into letting me play with her lipstick, and I had a ball. Dad, if that "sad clown" remark was a dig at my appearance, it wasn't funny! You're just jealous that boys don't get to have lipstick! While I was there, I also showed off my cute winter coat and hat. And got to sample a candy cane. Yum! Henry kept himself busy too, playing in the exersaucer that Grandma and Grandpa keep for him. So it was lots of fun all around, but I haven't even mentioned the best part yet! So check back tomorrow for more details. Hopefully the Twitter feed will be fixed by then. Hi there! Julia has been handling most of the blogging over the past week, since I haven't been doing much but dealing with yet another cold. However, I did want to chime in and share a video from over Thanksgiving that Dad shot of me playing with the same activity center that he had in his crib when he was a baby. (Julia also used to play with it when she was my age.) It's the rare toy from back then that's not considered dangerous for kids nowadays! Thanks Aunt Jess for helping me out! We have much more to share from our Thanksgiving weekend, but now that it's officially December, Henry and I are skipping ahead to the good stuff that happened after we got home. I've mentioned before that for the past six months, I've been accusing Dad of taking the Christmas tree away, and he would always reply by telling me that when Christmas time came around again, he'd bring the tree back out. Well, when I woke up Sunday morning after we got home, guess what I saw! The tree! With fun new ornaments! And new stockings for the whole family, with our names on them. My stocking has a pretty ballerina on it, of course. Here's a video of my reaction when I came down that morning. I see the nutcracker right away; it takes a few moments before I spot the tree. And I immediately ask about the mermaid ornament that we bought during our Wildwood vacation, which Dad promised to put on the tree when he brought it back out. You're probably wondering what Henry thought of the tree. Well, he really liked it too! Of course, he wasn't quite as taken with it as I was (then again, even last year, when I first saw the tree, I said "No! ", turned around and walked out of the room). Here's the video of his first look at it. I'm in the Christmas spirit already. Just 24 days to go until the big day!